What do squirrels do in the winter? It’s a legitimate question to ask. Chances are that you’ve spotted the furry little creatures amid the snow, which means that squirrels don’t really hibernate. Answering the question, however, isn’t that easy. Squirrel Hibernation: Yes or No? When the seasons start to change, it’s easy to observe how squirrels start getting ready for the winter. This is particularly true for grey squirrels – one of the species that can be observed most commonly in nature. During the fall, grey squirrels intensify their food foraging efforts. The food that they found is then either hidden in tree holes or buried under the ground. As you can imagine, these supplies are needed to help the squirrel survive during the cold winter. Squirrels don’t increase their food consumption before the beginning of the cold months. Unlike other animals, they can’t store a lot of fat in their body for insulation or survival purposes. This means that consuming larger quantities of food before the start of the winter isn’t going to make a lot of sense for a squirrel. This information is provided to explain one simple thing – squirrels do not hibernate during the winter. That’s why they hide a lot of food in order to ensure their survival during the months when nuts and seeds are scarce. So, What do Squirrels do during the Winter? It’s more difficult to observe a squirrel during the winter than it is during the wonderful summer months. Though they’re not sleeping like other animals, squirrels are looking for ways to keep themselves warm. In order to accomplish the goal, they spend a lot of time hidden in holes and their dens. A few squirrels could share the same den. This is an opportunity for them to keep each other warm. 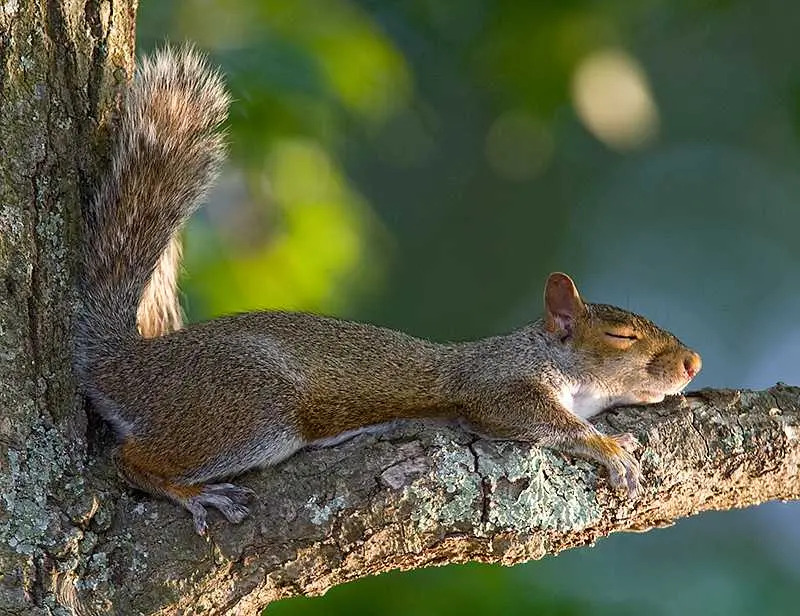 Grey squirrels and other common varieties tend to spend most of the time sleeping. They are mainly active in the morning when the furry little animals are likely to come out of the den. Regardless of the fact that they spend numerous hours sleeping, their sleep isn’t as deep as the one of hibernating animals. Squirrels tend to wake up during the day but they simply don’t feel like coming out of the den. There’s one type of squirrel that’s the exception to the general rule. Ground squirrels are the only member of the species that spends the winter months in hibernation. Ground squirrels are also known as gophers. They get in a state known as torpor. This is when their body temperature gets close to the temperature of the squirrel’s surroundings. The heart rate, metabolism and respiration will also slow down significantly. In other words, the ground squirrel enters the classic state of hibernation that many other mammals are known for. These squirrels are known for hibernating anywhere between four and nine months in a hibernation state. The number of months is heavily dependent on the age and the gender of the squirrels. Younger squirrels tend to hibernate for fewer months than the adults and the same applies to the males. As you can see, the winter can be pretty tough for squirrels. If they don’t forage enough food during the autumn, chances are that they’ll have nothing to eat. In times of desperation, squirrels are known for feeding on small birds (regardless of the fact that they are herbivores) and even stealing eggs. Now that you know that squirrels do not hibernate, you may want to help them get ready for the winter. One of the things that you can do is place a feeder in your backyard or in a nearby forest. Giving the squirrels larger quantities of mixed seeds and nuts to forage on will help the furry little beasts get ready for the winter and survive when the weather gets to be truly harsh. It’s a simple thing and it’s not going to cost you a lot of money. If you care about animals and nature, however, you’ll experience massive gratification as a result.